Hop on over to Kirsty’s for more creative spaces. Noooo! Don't put it up. I'll have yet ANOTHER awesome project to put on my to-do list. Oh, ok, the world needs Froggy. Oooooo I'll be-a-waiting for that tut!! Oh I love the frog! You'll be the best in all the world when you give this! Can't WAIT for that tut...but like the lovely mum I am...it will be ALLLLLL mine. I just love that hot frog. He's brilliant. can't wait for mr.frog to come my way! by the way, I hope my cursing about fish embroidery around here didn't have any supernatural effect on your fish mortality...if worst comes to worse I'm willing to share the blame with you though my dear! Hmmm - creative with fish stories and frogs - a real damp creator! that is one funky frog. has he got a pierced tongue? no, wait, i think thats a fly? I have a buckwheat bag...very adult and bland looking but does the job on my neck and shoulders. Perhaps what I need is something much cuter...like a Hot Frog! ...and I was thinking of your wheat bags these last couple of freezing nites. Hot frog is awesome. How kind of you to put together a tute. Looking forward to the tutorial...can you also do one on taking photos for blogs? I still haven't left comments on the birthing stories. Have to wait for the torrent of tears to stop welling up everytime I read them. Lisa. Yes! I'm excited for the tutorial. My little guy will love Froggie. 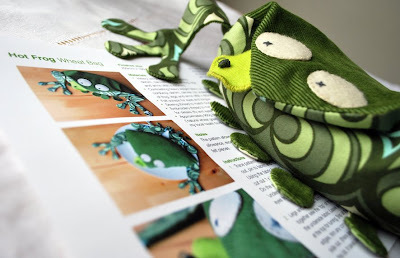 Is a hot frog the kid's version of a Hot Toddie? Can the two be combined for ultimate comfort? That is so stinking cute! I want one just for me! Well I guess that's fair.... 3 Hail Marys and a Hot Frog tutorial. I better start looking for some green corduroy!Hot Frog is awesome. As soon as I saw the picture i started singing "Galumph went the little green frog one day..." is that sad? Ok, frogs normally creep me out a little, but that is one cute little froggie! Ribbit! He is a very cute frog. HE is just so fricking darn cute!